We would love to have you visit us on a Sunday morning for one of our worship services. The information below will give you some direction on what to expect. 8:00, 9:30 & 11:00 a.m. The word of God (the Bible) is essential to everything we do at Providence. In our Sunday services, we worship through song, prayer, and the preaching of God's Word. We preach expositionally, meaning that we go through entire books of the Bible verse-by-verse to understand all of what the Bible teaches. We are located at 5625 Preston Road in Frisco, TX, near the intersection of Preston and Lebanon Road. Since our church is a converted car dealership, we have plenty of parking available on the north and south sides of the building! When you come in one of our two main entrances off Preston Road, you'll see our first-time guest tables, which are staffed with helpful people who can answer your questions, help you check your children in, and point you to the sanctuary. Stop and grab a cup of coffee on your way into the service and if you need any help on Sunday mornings, look for those wearing red lanyards - they'd love to help you. On Sunday mornings, we offer classes in Providence Kids for children from birth through 5th grade during all three services. In their classes, kids learn how all of the Bible points to Jesus through singing, teaching, and hands-on crafts to help them remember what they've learned. Throughout the school year, Providence Students (6th-12th grade) meet on Sunday nights from 6:00-8:00 p.m. for a combination of fun games, challenging teaching, real relationships, and purposeful small group discussions. On Sunday mornings, students are welcome to join their parents in the worship service. Following the worship service on Sunday mornings, we’d love to meet you in the Connection Center, located just outside the double doors of the sanctuary. We’ll have a welcome gift for you and our pastors and leaders will be available to answer your questions and/or pray with you. Starting Point is . . . a very good place to start. At Starting Point, you’ll learn about our mission, our history, and what drives everything we do at Providence. Whether you’re ready to consider becoming a member, or just want to learn more about us, Starting Point is designed to get you connected at Providence. You’ll meet members of our staff, and we’ll answer any questions you have for us. Have a question about Sunday mornings? 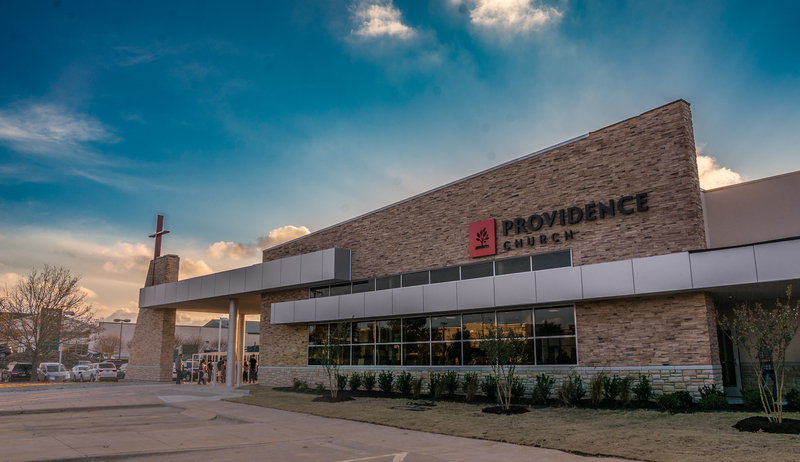 Contact Matt Moore, Director of Connections, at mattmoore@providencefrisco.com. We hope to see you on Sunday! How early should I arrive? If you're checking in kids, we recommend arriving at least ten minutes before the service. Feel free to come early and grab a cup of coffee on your way into the service. What should I wear? Come as you are. You'll find a wide range of dress at Providence, from shorts to dresses and sports coats. Do I need a Bible? If you own a Bible, yes, bring it! We begin each sermon by opening our Bibles. We teach from the English Standard Version (ESV). If you don't own a Bible, we have Bibles available and would love for you to take one of them with you as our gift. What songs do you sing? We sing a mix of old and new hymns and songs, all with a commitment to biblical faithfulness, theological richness, and congregational participation in our singing. Check out our Spotify playlist for a sampling of our worship music. Can my children join me in the worship service? Absolutely. While Providence Kids classes are provided for children birth-5th grade, we know that some families want to worship together. Your children are welcome to join you in the service. We also have a nursing room available.